The last few years more and more new techniques are presented to the IT field. Probably the hottest word at this moment is virtualization. Application virtualization and hardware virtualization is becoming more and more popular. The next step in the virtualization market is virtualizing your complete Operating System and that's exactly what Ardence is doing. Also for Terminal Servers could this be very usable (think again of the Terminal Server Basic to keep your server 100% identical), so the product is definitely a VanBragt.Net SBC Centre review worthy. Ardence exists of two components. The first component is the Ardence Stream Server. This server stores the virtual disk for the virtualized operating system(s), the software to stream the operating system and the configuration of the clients. The second part is the client. The client will be used to create the virtualized operating system and organizes the stream of the operating system on the client side. First the server part needs to be installed. The installation exist of one single executable. After unpacking the installation a Window will be displayed where you can choose to install the server or the client. When selecting the server part the standard questions like the license agreement and the installation destination will be presented to you. During the installation you could choose which component you want to install. All components (except documentation of course) are needed for Ardence to function, but you could use another software product if you already have that in-house. During the installation notify- and new hardware windows will pop-up that the Ardence Virtual Disk software has not passed Windows Logo testing. It could also happen that these windows will appear behind the Ardence installation dialog and you need to drag this window or use ALT-TAB to acknowledge those windows. The clients needs to be installed during the creation of the virtualized Operating System, which will be described later in this review. Also during this installation several notify windows will pop-up (or stuck behind the default dialog) and also a Installshield error will appear in the beginning of the installation. 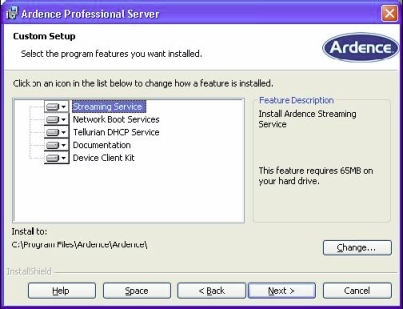 Ardence supports more Ardence Streaming Server to prevent a Single Point of Failure by using their High Availability option. The manual does not mention anything about unattended installation of both the server as the client part. After the reboot the Ardence server components need to be configured. Via Ardence Configuration Wizard available in the Start Menu the services will be pointed out (and configured), which will be used by Ardence. First you need to configure the DHCP or BOOTP service. Ardence delivers Tellurian DHCP in his installation package, but also Microsoft DHCP can be used (they can also be used combined if necessary). Next is the PXE service, followed by specifying the location of the Ardence Streaming Server database (Access based MDB file), the network card for the streaming services and the license server (embedded in the streaming service). If the wizard is finished and the service are restarted again, it is to time to start the Ardence administrator tool. Within the Ardence Administrator tool your server will be displayed. On this server some settings can be defined to tune the environment, but let's make the server ready for operating virtualization. 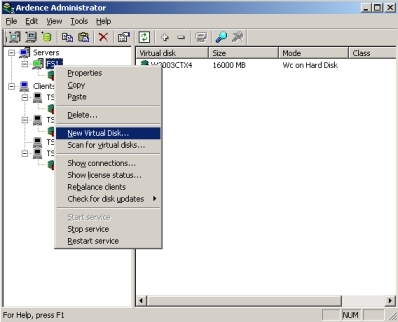 Therefore you need to create a Virtual Disk on the Ardence Server. This can be done by right clinking the server and choose the option new Virtual Disk. A small wizard appears which kind of disk (default bootable disk for client system) followed by the location, the name of the disk and the size of the disk. After the disk is created, the disk needs to formatted for it can be used. This can be done to map the virtual disk on the Ardence server and use the default Windows tools (don't forget to unmap the disk again) or later on the Master Client (using the same tools). To create the virtualized operating system the disk needs be placed in the access mode Private Image (Single Client, read/write access). Now the disk is available it is time to configure our Master Client. This client will be used to create an image. Just install this client as usual with the operating systemen, device drivers, service packs, software, etcetera. When this client reflects your configuration (of the Terminal Server or Windows client for example) it is time to install the Ardence Client software on this client (as already party described in the installation paragraph). After the Ardence client software installation needs to be restarted. Boot the client from his network card and the Ardence PXE service will jump in. Because the machine is not already registered into the Ardence database some configuration questions will be asked. You need to specify the server name, a description, which virtual disk you would like to connect to the machine and the boot preference. It is also possible a server manual into the console. To accomplish is that you need to specify the MAC address of the machine. Because this is the Master Client the hard disk should be selected as the first boot option. After the restart the machine needs to started up using PXE again, will connect to the Ardence server and will startup normally from his hard disk. In this way the virtual disk is now connected to the Master Client. Using Disk Management assign a drive letter to this disk and format the driver (if not already done). 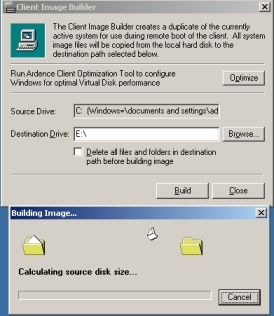 With the Ardence Image Builder component an complete image will be created of your master client system drive on the virtual disk. If this process is finished shutdown the client. When the client is powered off the virtual disk is not locked anymore and the properties can be changed. Now it time to change the access type to Standard Image (multi client, write cache enabled) and determine where you would like to store the cache (serverdrive, client drive, or client memory). If the clients (master as the other clients) are in domain also check the option "Enable Active Directory Machine Account Password Management". To let this function correctly you should add a policy setting "Domain Members: Disable machine account password change". Via the properties of the Ardence you could define the period Ardence should change the machine account password for security reasons. Now the disk is ready to be used by other clients. Add the destination clients manually via the console or via the PXE boot option. Configure the server to start from the virtual disk. When the client is available in the console and should be able to connect to your domain you should use the command setcomputeraccount.exe to add the client to Active Directory. Now you're ready to start you client using a streaming operating system. Change the client boot behavior that it's boot by default via PXE. Using the Ardence PXE component the virtual disk will be connected and used to start the operating system. Except the Ardence bootscreen at the PXE moment, nothing is visible that you are starting a streamed virtual operating system. When the logon prompted is available you will see that the computeraccount is changed to the name you entered during the preparation of this client. 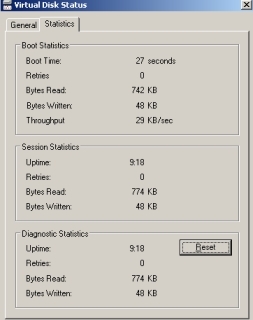 When logged on you will see the icon of the Ardence client in your system tray, displaying that the disk is active and session information. A nice option of Ardence is that if the stream gets interrupted the client just stops loading, without errors or blue screens. After the stream is active again the process just start where it stopped before. Because Ardence is using a kind of cloning technique you will probably need to update the virtual disk with new application, update of applications, patches and/or hotfixes. Therefore you should create a copy of the virtual disk (available as a file on your Ardence server). Import the copy of disk into Ardence, change the access mode to private and assign that to one of your client. Boot from this disk using the PXE component, followed by the installation of the software, patch or hotfix. Power down the client again and configure this copy exactly the same as the current virtual disk (Ardence calls this the master disk). Via a script Ardence compares both disks and creates a delta. This delta will be used to update the client is they boot again. Using this mechanism you could easy go back to your previous configuration because you could configure the clients to use the previous image again. Also you could create a complete new build or more virtual disks for other functionalities (in a SBC environment for a silo server). It is a pity that you can not configure groups, configure the settings on that group and add servers to the group inheriting those settings. In this version all the configuration settings are done per client. Streaming your Operating System has lot of advantages. It the perfect way to guarantee that all your servers are 100% identical (after a restart the system will be going back to the default of the images). Also getting a new client in production is just a task of a few minutes and a rollback to a previous state is as easy as a restart of the clients). Of course there are also some limitations like more network traffic, more dependency of the network and all disadvantages of using cloning techniques. Looking at Ardence specific the product is pretty easy to use, supplied with a good manual and the delta approach is wonderful to update your virtual disk with the possibility to rollback very easy. The installation of the product could be made better and the administrator console can be improved for bigger environments looking at the configuration of the clients. In this review I gave you a brief overview of the OS virtualization using Ardence. At BriForum US (Chicago) in April 2007 I and Ruben Spruiijt will go into detail how this product works. In my customer case I will explain how ardence can be used with Citrix Presentation Server. So check my session if you are attending BriForum. Of course all information will also be published on VanBragt.Net SBC Centre after the BriForum. The update approach using delta is good option. The installation process should be improved.